With an emphasis on sustainability, the building is nestled into the side of a 30' hill. The infusion of the natural light from skylights above makes the building interior feel open and airy. The University has expanded the College of Health Sciences curriculum by the introduction of a new accredited graduate level “Physician Assistant Education Program." This new program will help the University fulfill its mission by preparing graduates for a career in the life sciences and health sciences professions. The building program is comprised of two new departments within the College of Health Sciences, the Physician Assistant Program (11,813 NSF) and the Speech Language Pathology Program (5,063 NSF). Shared space will also be provided for the College of Health Sciences and the College of Pharmacy called the Inter-Professional Area (2,005 NSF). The building is designed as a (3) three story building measuring 57,000 GSF. The slope of the site allows the building to appear as a three story façade facing the campus core and as a single story façade facing the residential neighborhood. The SLP program is located on the ground floor and required limited excavation into the side of the hill. A central stair traverses the slope 15’ vertically and leads to the second floor where the PA Program is located. The PA Program occupies the entire floor, with classroom/student amenity space organized around a central circulation spine. Administrative offices are placed along the front perimeter of the building, taking advantage of the floor to ceiling perimeter glazing system. Clinical spaces are located at the rear of the floor plate and are close to the classrooms in the existing CHS building. A student lounge is positioned above the building entrance in a large “picture window” that visually connects the students back to the central campus green. The central circulation spine continues to traverse the slope of the hill to the third floor. A large window area at the location of this stair further infuses the interior of the building with natural light and acts as a ”way finder” to the third floor. The third floor is currently fallow. Wisely, the university elected to construct this additional space for future growth of the College of Health Sciences. The existing College of Health Science building is located at the southernmost tip of the campus in a turn of the century single story old industrial building that had been renovated to include classroom and administrative space. A four story addition, Glasser Hall, was constructed along the south edge of the existing building providing additional classroom and administrative space. The main entrance to this continuous structure is on Woodland Ave. The terrain/topographical slope of the site makes it necessary to enter the building along Woodland Ave., at a location that is remote from the central pedestrian core of the campus. The “brown field” site for this project is a behind the existing facility on a triangular parcel of land that has a 35’ change in elevation across the property along the north/south axis. The University never considered this parcel of land suitable for construction because it was thought the terrain would be too difficult to develop and that the elevation delta would isolate any development from the core of the campus. Large rock outcroppings further deterred consideration of this parcel, the last available parcel owned by the University, for use. The design team aspired to develop this parcel of land to allow for a continuous flow of program between the new and existing buildings. 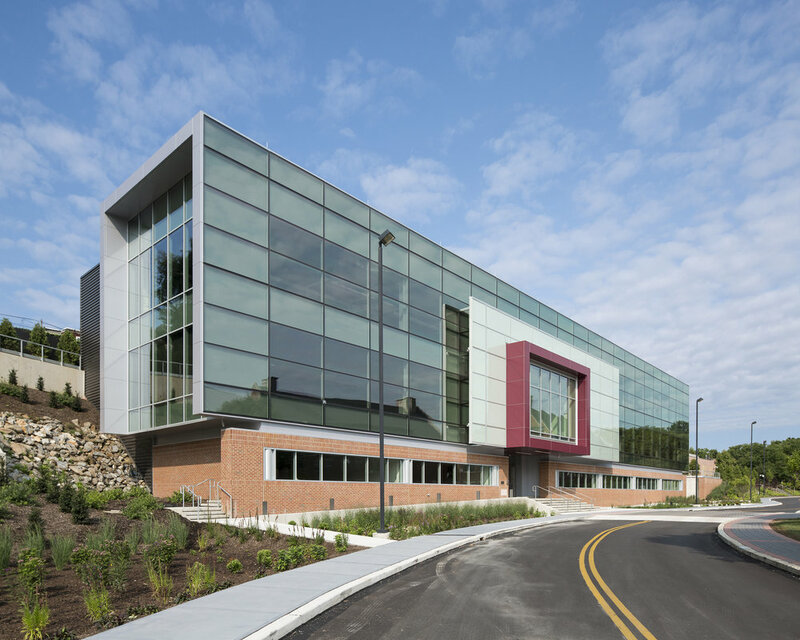 At the same time, from a campus planning point-of-view, the new building is situated on the site to take advantage of the steep slope and to visually connect the building to the central campus green. The entrance of the new building is positioned at the end of a north/south pedestrian pathway that creates an important view corridor between the central campus green and the entrance to the new building. The added advantage of this is the creation of a building entrance that allows the student population to stay within the campus core, limiting the need to traverse Woodland Ave.